One major difference compared to last gen is that there are two handhelds this time, both still going strong in terms of sales and games, at the release of a new one. So people can either decide to get one of those and be treated to a big library of great games (with lots still coming) or opt for the new one with barely anything worth owning (nothing at the moment, imo). There's more than half a year to go so things can definitely change but so far the NGP might stand a chance, I think. While true, the 3DS is backwards compatible with the DS. You gotta remember that DS didn't do that great until the DS Lite came out. It's possible 3DS will follow the same pattern as doing ok until 3DS v2 comes out and lights up the charts. Same thing happened with PSP. It wasn't until the 2000 came out that it started doing actual good numbers. Same thing with the PS3 slim. What I gather from all that is that Japan waits for hardware revisions. It's not a tendency to wait for hardware revisions so much as the price/hardware/software combination for those systems was lacking for some time. With Brain Age 2, Animal Crossing, and Mario Kart DS hitting within about a month's span, things blew up. DS had a week of 600K a month before the Lite was announced. May be misremembering, but those last few weeks might've been when they apologized for such short supply? 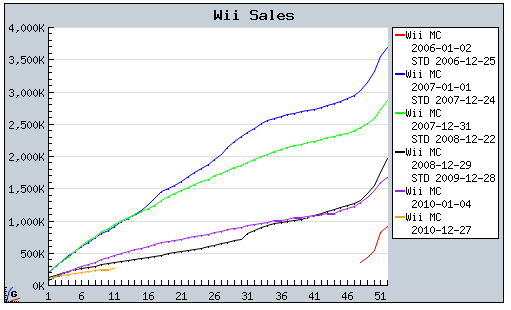 DS sales were already crazy before the lite in december 2005 when they had released animal crossing and mario kart. nsmb and ds lite were like the final blow. I dont think that the 3DS needs a redesign - just those first party killer apps, which really uses features like street-pass. yeah i dont get people talking about the myth of a slumping DS before the DSL release. DS was pretty strong before DSL was released. It definitely had its slumpy period, but it got better. Okay Nintendo it's okay to totally neglet and forget about the Wii, but if you're going to do that you need to have a new console on the immediate horizon. Like this Christmas..
What, you mean a -57% year to date comparison isn't healthy? Now that Garaph is back, let's do this in chart forum instead. This year is orange. I don't even think the PS2 had that much of a YOY decrease from 2006-2007 when it was successed by the PS3. The Wii is dropping so hard, you would think another Nintendo home console already succeeded it. Backwardws compatability is a good feature to have but I don't think it sells systems, new ones especially. If someone wants access to the DS library, at this point in time, then I see them going for the cheaper DS. Not sure if the same will apply to the NGP and PSP since games will get enhanced for the new system, I'm sure MHP3rd with dual analog stick support will turn some heads over there. NGP also negates backwards compatibility by not playing UMDs. I think it'd make it more of an issue there to be honest, I thought Japan overwhelmingly preferred physical products to digital? What are PSN sales like in Japan? It's nice to see there is no real shortage of 3DS in Japan, it keeps selling. It keeps going down, but it keeps selling. Should break the million soon enough. Can't we have a happy medium of sanity, you guys? very difficult to say it's a failure, but certainly "it keeps selling" isn't the best way to find a positive outlook, 360 keeps selling also. Now my opinion was always March - Middle of may of this year were the viral penetration movement - Ar games, 3d all effects to show to your friend who would then want to go buy one. In the May June you get Zelda, internet options and biohazard, tales, the real launch of the system. I really think the earthquakes hurt Nintendo strategy this time more then a normal type of console's marketing would, folks simply weren't in the mood to show off their 3ds, and the topic got carried away. Indeed. At just the moment when you'd expect that a "viral" handheld would start to gain traction, the catastrophe in T&#333;hoku (and the ongoing nuclear crisis) threw everything up in the air. More established systems seem better able to cope on the strength of their back catalogue, but I'd argue that a new platform, with no real must-have games yet, is going to struggle. Edit: I think all CyberFront games have been delayed. We rarely get numbers, but Atlus released a report saying that while 90k UMDs of Persona 3 Portable were sold, 10k downloads were sold. Sony probably yelled at them for releasing that info. Who knows if that attach rate has changed. I imagine it probably has for the better as more of the big name games are available on PSN (granted, not all of them) - especially since the PlayStation Meeting confirmed DD-only BC. I wouldn't be surprised if the NGP had a significantly stronger launch if Sony get it out in time for the holidays, and Monster Hunter is offered. Have they released a Mario 3DS game yet? Finally, new games! Dead or Alive would have stormed the charts. DQ will as well as Blazeblue. DoA will have its faire share of aficionados later on, don't worry. Is there any news about how long Nintendo will contunie to manufacture and ship out older DS models (not 3DS)? Randomly surfing the internets(not really, wanted to read jimbo meltdowns) and came across this..
Looks like for the first time in a bit the difference will but less than 5. Doesn't mean anything really but semi interesting. 11. /	14. [WII]	Donkey Kong Country Returns	(Nintendo)	-	8,481 /	? 16. /	21. [WII]	Wii Party	(Nintendo)	-	6,247 /	? 19. /	22. [NDS]	Pokemon Black	(Pokemon Co.)	-	5,129 /	? How well did Blazblue CT sell on PSP? I figured most of its audience were on arcade for the fighting or console for the visual novel. Looking at the latest Famitsu Top 30 (week starting March 7), I noticed a bigger-than-normal discrepancy with Media Create. Dear Drops Distortion is Famitsu's #24, but was Media Create's #49. Under 4000 in either case, so I guess it doesn't take much of a unit difference to wildly change place. All Resident Evil 5 versions racing towards 1 million. Really hard to say that. We aren't anywhere close to a major holiday season. Couple that with what is going on in Japan. Like suggested once those big titles come out things will be different. What needs to happen though is for 3rd parties to take advantage. Nintendo is giving them a big window before they drop Zelda, Mario, and I'm sure they're hoping Kid Icarus will do very well. Seems so weird to have Super Mario All-Stars, NSMB, and NSMB Wii all charting. I know there have been other times with lots of Mario charting, but not so many of the same genre. All from CyberFront but Mamoru-kun are delayed to 4/14. Sooo, good week to go back to predicting right?. Looking at DQMJ2P, Amagami PSP, both BlazBlue, Famista 2011...then wondering if Naruto, Mamoru-Kun or Onechanbara are worth predicting for. crysis 2 is getting a fair amount of push on blogs, perhaps add in the ps3 version of that? I wonder if BBCS2 on 3DS can outdo the PSP game. SSFIV3D wasn't that big, but it's been stronger than any PSP fighter besides TDR. - NEW! Predictions will be compared to sales numbers from Media Create down to single digits from now on, as in not using rounded to nearest thousand like before. You may still predict as you wish. - (As usual) Any title missing MC Top20 will be taken out of the predictions. - (As usual) Deadline is Wednesday 30th when Famitsu Top10 is posted for the Mar 21-27 week. - PS3 Crysis 2 releases on April 1st and it'll have 3 days of sales covered vs default 4 for every other title. *Second week in row Media Create gave rounded numbers for software sales. So being in 3DS image playing mood, I decided to try a bit of 3D graphing. Results... kind of neat, nothing spectacular. Basically I just took some game line graphs and shifted lines about so each line wouldn't seem to be on exactly the same plane as the other. In the first example the 3 games never really overlapped so it's less obvious, and in the second example there's a lot of overlap and it seems noisy. The lines are harsher rather than the anti-aliased look usually seen, but I just did that so automatically selecting/copying/pasting lines of a given color would be easier. Go Donkey, break their back. B-N expected 150k from Idolmaster 2. they'll miss the target slightly.